What took me so long????? I discovered Bulgur (or cracked wheat) for my cooking a few days ago. I must admit, I never really had it before. It is so delicious, the whole 500g-package was being used up within two days. I put it virtually in every meal. Husband liked it, even the kids accepted it. They normally eat any kind of grains just with a little melted butter and some salt. Works well with bulgur. I like the size and texture bulgur grains: sizewise between rice and couscous. The texture keeps a bite to it, after cooking. Therefore, perfect to be used in salads, as side dish, even in soups. Bulgur wheat is a natural whole grain food, high in fiber and carbohydrate and low in fat. It has a low glycemic index. It is rich in "B" vitamins, iron, phosphorous and manganese. It complements the protein profile of legumes such as pinto beans. Its "B" vitamins complement the folate in vegetables such as spinach, asparagus, broccoli or Brussels sprouts. Soak the dried beans for a few hours. Cook in slightly salted water until tender. Make sure not to overcook them. They are better in salads when they keep a bit of a bite. Drain and set aside. In a bowl, pour 3 cups of boiling water over bulgur. Let stand for 15 minutes. Drain and press out remaining water. Transfer bulgur into serving bowl. In a wok or non-stick skillet, heat olive over high heat. Stir fry onion for about 5 minutes, then add peppers and cook for another 3 minutes or until golden brown. Add the chopped bok choy and cook until wilted. Take off the heat. 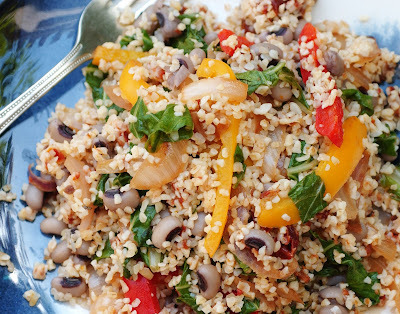 Combine beans and vegetables with the bulgur. Stir in sun-dried tomato pesto to taste. Can be eaten warm or at room temperature. Combine 60g of sun-dried tomatoes with 60g of pine nuts (or walnuts) and some 2-3 tablespoons olive oil. Optional: add 1-2 garlic cloves. Blend in a food processor until smooth.